Our last stop of Day 1 led us from the Japanese Pavilion to a country in our very own time zone, just further south…welceome to the Mexican Pavilion! *This is a returning pavilion for 2016 – last held in 2014. Wow! Stepping into the largest venue for Folklorama was breathtaking. The Mexican pavilion makes use of its space with ample seating, a grand stage, and an organized way of minimizing lines with separate food and drink sections. Vibrant and colourful costumes also make for a very visually appealing performance! 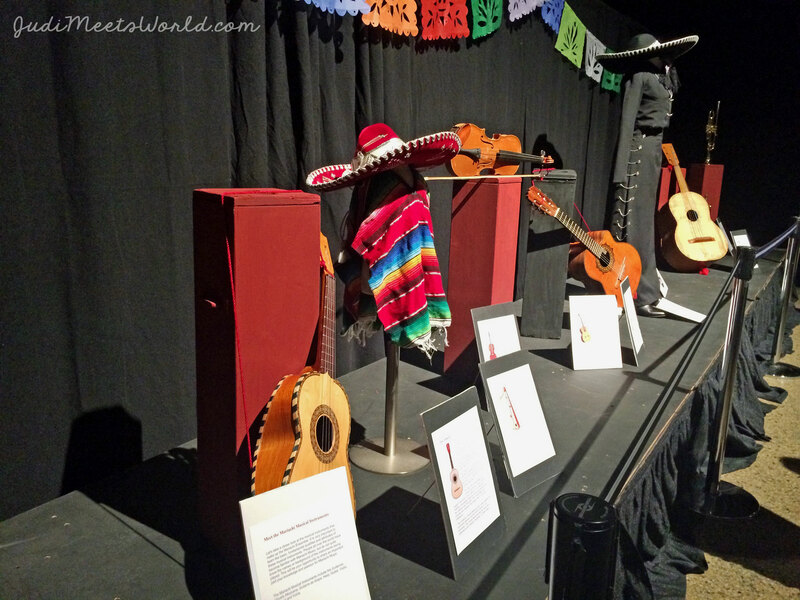 The cultural display focuses on two aspects of Mexican culture – tequila and mariachi. They have a live agave tequilana plant as well as replicas. In addition to the replicas, they walk you through a step-by-step exhibit of how the tequila is extracted and aged to the variations of tequila on the market. There is also a history of the different types of bottles used for selling tequila. The volunteer by the tequila stand that evening was humorous, informative and welcoming. In addition to the process of tequila making, a display of mariachi costumes and instruments provided an educational moment for festival goers. Each item has an information card with history and facts. This also familiarized guests to the performance they were about to see on stage! That connection between stage and education heightens the experience at this pavilion. Volunteers circulate and make sure that guests have been given a thorough tour and explanation of the cultural display. There are vendors lined up with different things for sale right beside the food ticket line. The vendors were so eager to share their craft and answer any questions from curious guests. You can’t have a cultural display about tequila and not have it served! The bar and food are on opposite sides of the venue, with one central line-up by the cultural display to purchase meal and/or drink tickets. The full combo dish has Mexican rice and salad and a combination of all 3 meat options: bistec ranchero (beef), pollo chipotle (chicken), and carnitas (pork). They gave us an authentic tray of tortially chips and pico de galla. The pico de galla really reminded us both of the times we were in Mexico! As soon as they announced the starting of the show, trumpets roar from a hidden room behind a curtain. In comes a 7-piece mariachi band, making their way through the audience and onto the stage! Mariachi Continental also shares the stage with the Ballet Folklorico El Mazatleco del CETIS 127. 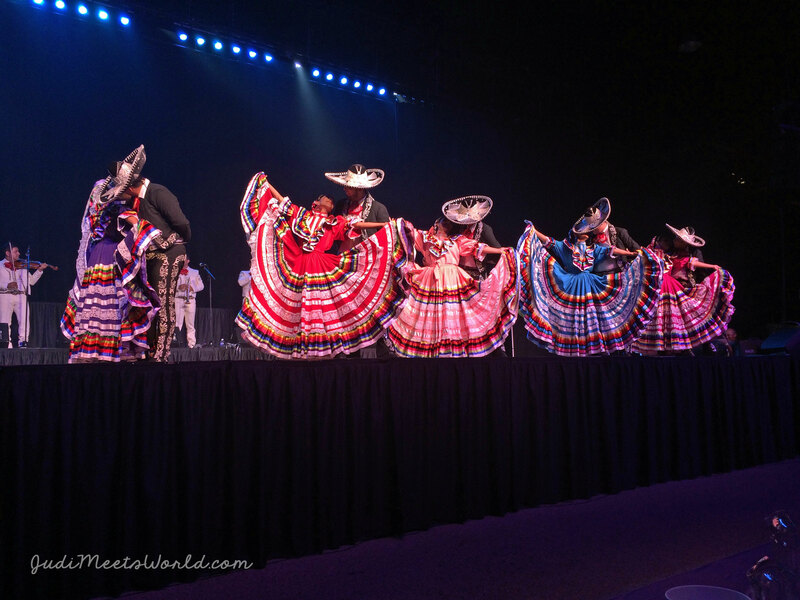 The dance troupe’s footwork, quick hands, and vibrant costumes – along with Mariachi Continental’s upbeat accompaniement – truly leave an impression as you leave the venue. Also used on stage are real tequila bottles and machetes! Not an easy feat, especially considering that at some points, as many as 24 performers are on stage. No spoilers here – you need to see it for yourself! All guests receive a pavilion guide which highlights the performers, as well as provides a menu. Another reason to go is the one-on-one attention and the approachable volunteers. Male Adult Ambassador Sergio Pardini was so hospitable and really made sure the special guests and VIPs were having a great time throughout the evening. Viva Mexico! Make sure you stop by and let me know what you think!